Buy Online Cigarette Bins Direct, UK - manufacturers of Wall mounted cigarette bins, outdoor ashtrays and ash bins. The websites creator or author is Webspace Unlimited - web design, hosting and programming. 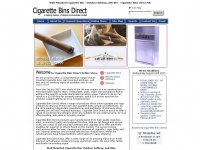 © Cigarette Bins Direct is the owner of the copyright for this website. two profiles were found for Cigarette-bins-direct.co.uk in social networks. Among other social networks the website is represented in Facebook and Twitter. The web server with the IP-address 79.170.44.128 used by Cigarette-bins-direct.co.uk is run by Heart Internet Ltd and is located in Great Britain. There are many websites run by this web server. The operator uses this server for many hosting clients. In total there are at least 197 websites on this server. The language of these websites is mostly english. The websites of Cigarette-bins-direct.co.uk are served by a Apache web server using the operating system Unix/Linux (Unix). The software used to serve the webpages was created by using the programming language PHP. XHTML 1.0 Transitional is used as markup language on the webpages. To analyze the visitors, the websites uses the analysis software Google Analytics. Indexing the data of the website and following hyperlinks on it is explicitly allowed by robot information.